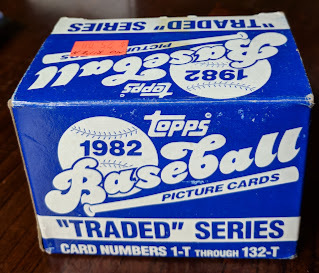 I was out of town during last month's card show, so I was extra excited for September's show today. I was a little thrown when I showed up and Bill-- the dealer whose bins I usually spend most of my time browsing-- wasn't there. 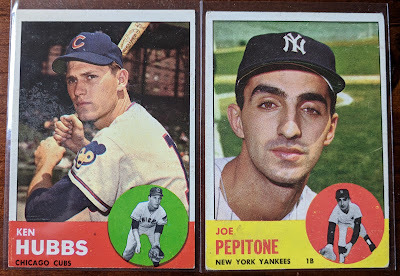 So Plan B went into action and I set out to work on the 2 vintage sets I'm working on. I left after making purchases with 3 different dealers. For simplicity's sake, let's say all the singles in this post ran me about a buck each, though some were a little less and some a little more. I was very happy to dig up a bunch of additions to my 1957 Topps setbuild. Prior to the show, I was sitting at 53.24% complete, and now I've passed 60%. Umm... 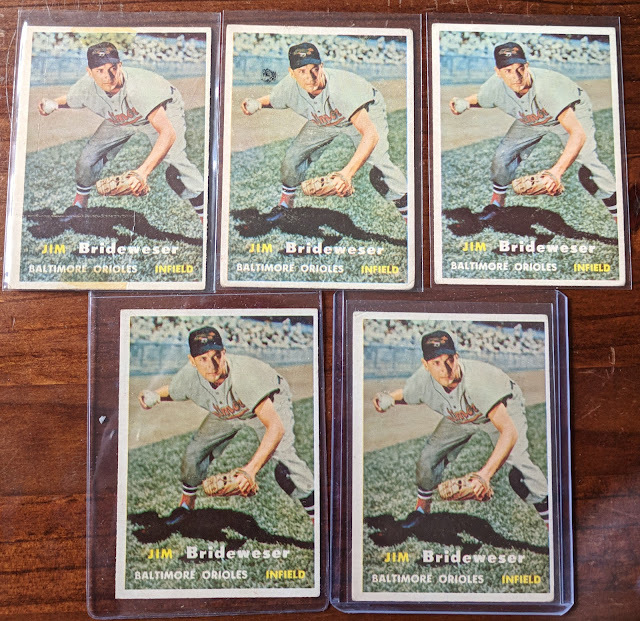 I felt quite the fool when I got home and sorted the cards, realizing I inadvertently brought home quintuplicates of Jim Brideweser here! I've bought dupes before, perhaps even triplicates once or twice, but accidentally buying 5 of the same card-- at least one from each of the three dealers I bought from today-- yeah, I think that'll stand as my all-time record. There were a couple other dupes and a couple "oops, I already had that one" from today, but nothing too bad besides this. 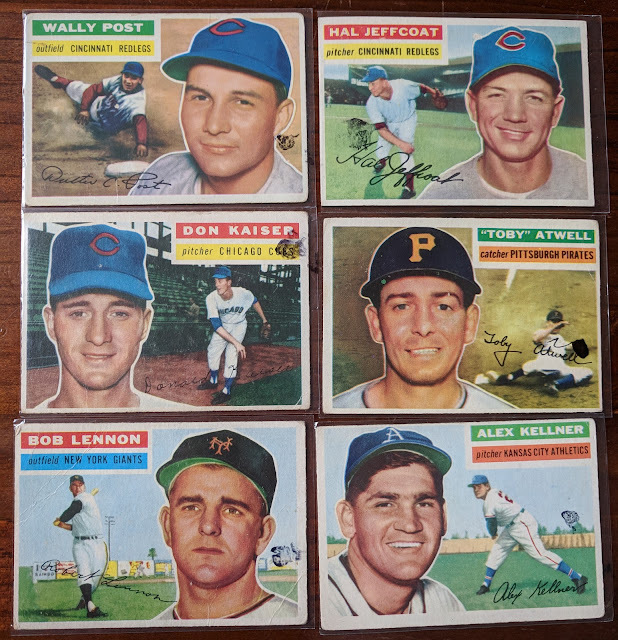 Founds some good '64 Topps, too, including HOFer Robin Roberts, which is an upgrade for me. Tim McCarver and Harvey Haddix were a couple familiar names I was happy to land. I had been one card away from ⅔ complete with this set, and this lot bumped me up to 68.76% (405/589). Couldn't resist some off-condition '53s for a buck a pop. (well, turned out closer to 50¢ with the final bulk price). The ink marks in the upper right are on the sleeves, not the cards. This was from is the old vintage dealer Gene who (mistakenly?) overcharged me last time I bought from him, much to my chagrin upon realizing it driving home. But he took good care of me this time, so no hard feelings. 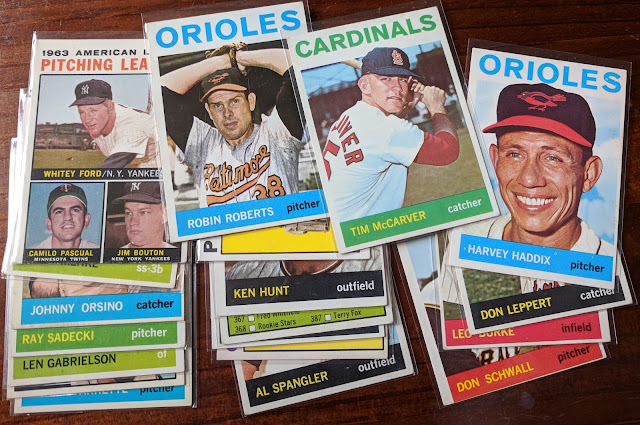 I haven't talked about it much yet, but I'm working on a "Flagship Binder" with one page for each set going back to '51. 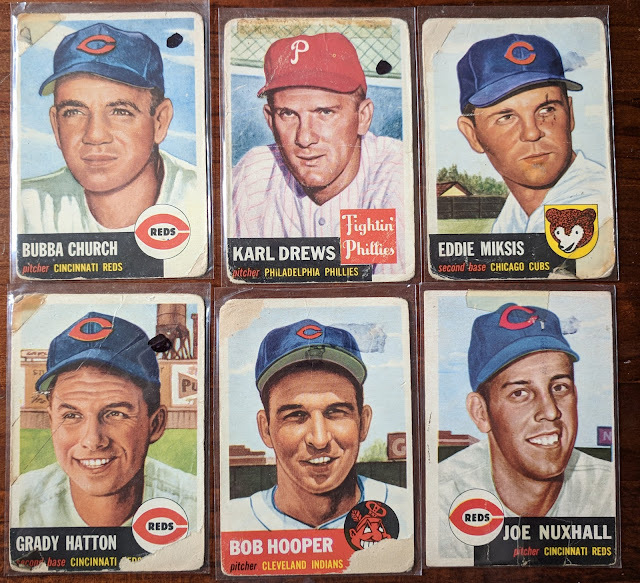 And I realized I didn't have any available 1953 Topps for the project. I only own like 2 or 3 '53s and all are in PCs. But now I'm just a couple cards away from a full 8-pocket page. Karl Drews is the odd man out here, with the other guys all wearing basically the same cap. Old Bowman cards are fun when the price is right. 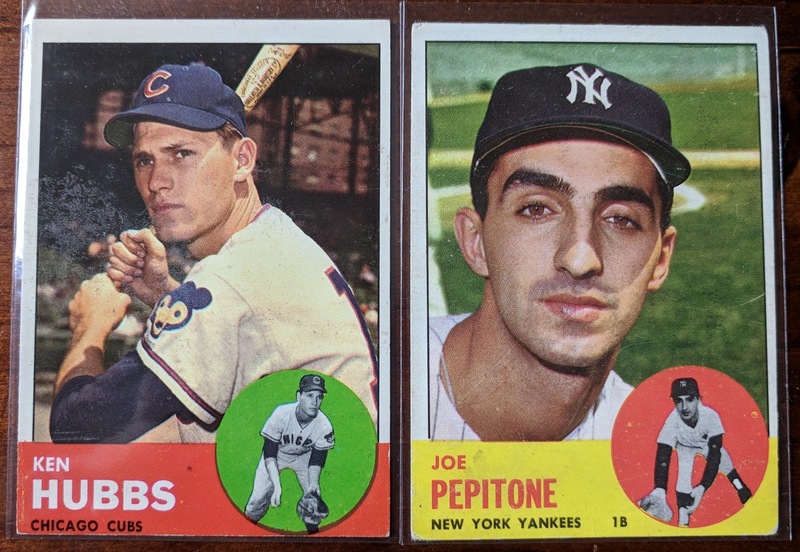 Picked up a couple 1963s that called out to me. 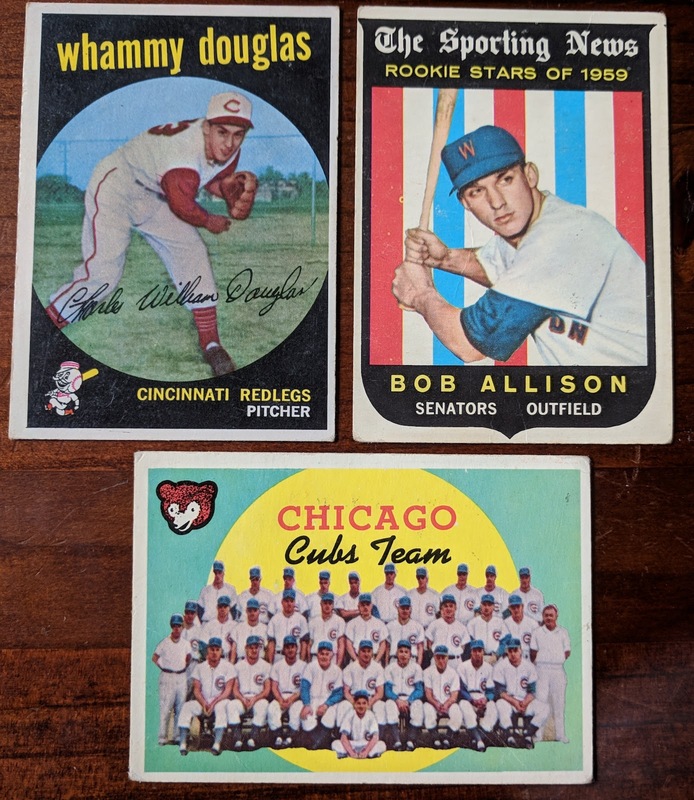 Nice trio of Billy Williams. Three 1959 Topps cards caught my eye enough to throw on the stack. More familiar names from the past. 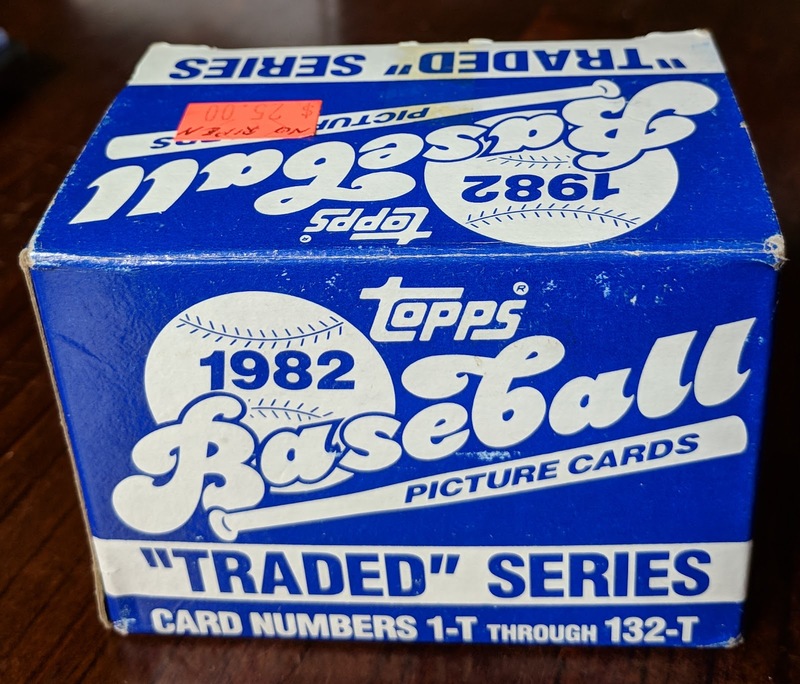 It was just a few days ago I trumpeted finishing 1982 Topps and mentioned I wouldn't mind adding the corresponding Traded set to go with it someday. Well, picked this up for a bit under $20. Of course there's a catch.. it did not include the Ripken. The guy said he had that one graded and sold it on eBay. So I'll still need to track down a Cal one of these days, but nice to get everything else taken care of, at least. And the seller was the old vintage guy who moved away a few years back, but he drives up to the show once in a blue moon. Way back at my first time attending the monthly show, he was the first dealer I ever bought from, so it's nice from a sentimental standpoint to pick up cards from him again. 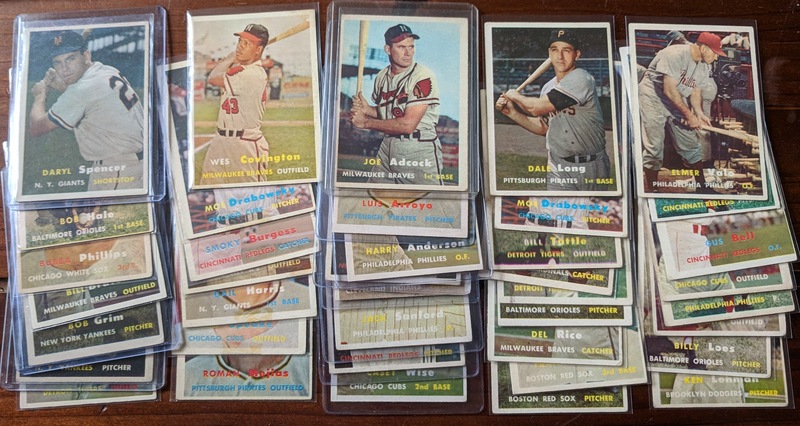 So that'll do it for September's card show haul. Thanks for reading! Cool to see that Bubba Church card. I bought an autographed copy of the 1993 Archives replica a few years back, but it definitely is hard to beat the real thing. Looks like you had a great haul. Normally dupes can be excellent TTM fodder material, although it doesn't look like Mr. Brideweser can reply to any fan mail anymore though unfortunately. The '63 Hubbs goes for a pretty penny in these parts. Passed on one for $15 earlier today just south of Chicago. Nice find! 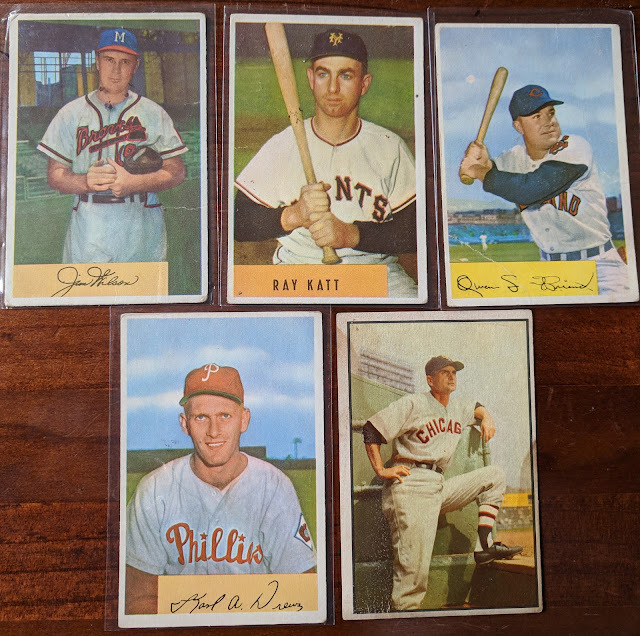 I've had some card show duplicate issues too, but 5 is next level. The good news is that you surely can find trading partners for them. Also, Ray Katt sure does have a precise autograph! I love the flagship binder. I've seen a few do it (including the dormant Napkin Doon), and it always looks great. Very cool pickups Gavin, especially that Nuxhall. Love that 64T Haddix. By the look on his face, he's very pleased by all of this vintage you purchased (even the 5 Bridewesers). If you're interested in trading them, I'll take any and all of the Brideweser's that you don't want. i could use a brideweser for my 57 set build. I bought four of a few 2018 A&G singles at my last show (it's hard to keep track when almost every dealer in the room has some), but I can't say I've ever hit quintuples before. I guess...congrats? Geez, that set for $20...I remember when that set used to command 10X that much!